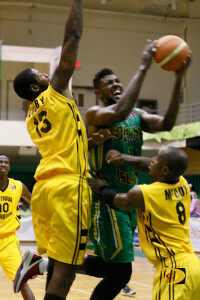 In a matchup of old Leeward Islands foes, the end result was the same as the first time they met in St. Kitts in 1985 for the Leeward Islands Basketball Association crown. Antigua and Barbuda overcame an early 16-5 deficit, then overpowered the BVI and walked off with an 82-73 triumph in the bronze medal game of the Caribbean Basketball Confederation men’s championships on Sunday night. It marked the second successive year the BVI has hosted and have had looked on in disbelief as their rivals jubilantly celebrated on their turf and more importantly, advanced to the Centrobasket tournament. After victories over St. Vincent and the Grenadines and the Cayman Islands, the BVI lost a one-point thriller to Barbados, 77-76, after coming back from a 17 points deficit. Then came an 89-70 loss to the U.S. Virgin Islands, but they advanced to the medal rounds on points by virtue of an 84-69 victory over St. Vincent and the Grenadines—who beat Barbados 70-63—as all ended group play with a 2-2 record. Then, they lost to the Bahamas, 85-68, in the playoff setting up the match with Antigua—a 108-66 loser to the USVI. In the matchup with Antigua, it didn’t help that the BVI lost center Kleon Penn—who had five rebounds and two blocks— in nine minutes to a right ankle injury, trailing 31-25 with 5:42 in the second quarter and ended the half down four, 38-34. Steve Parillon too got injured and only saw 3:10 of court time. Kelvin Samuel opened the BVI’s third quarter with a 3-pointer and Kennedy Bass scored in the paint with 9:21 left to give the hosts their first lead, 39-38, since sprinting off to 16-5 in the first quarter. Antigua’s Captain Sharife Sergeant who scored two first half point and finished with 10, gave them the lead for good with 7:19 left, although the BVI came within 52-50 with on Randy George’s free throw with 40 seconds left. Although the BVI outscored Antigua 28-23 in the fourth quarter, Antigua closed with an 8-0 run to complete outscoring the BVI 50-32 in the paint. Earnest Scott lead five Antigua players in double figures with 24 points and 11 rebounds. Raviel Burton came off the bench and poured in 23 and pulled 11 boards. Lennox McCoy finished with 12 while Clinton Joshua added another 10. Halstead Chiverton was the BVI’s top scorer with 22 points. Kelvin Samuel added 19. After St. Vincent and the Grenadines used a 20-8 third quarter advantage pad its lead to 65-47, Suriname who trailed by six at the half, pummeled St. Vincent 40-15 in the fourth quarter and placed fifth following an 87-70 victory. Barbados—after a one-point thriller over the BVI and giving the USVI its biggest test—were upset by Suriname in the playoffs, then had to settle for seventh place after beating Bermuda, 78-73. Cayman Islands used an 89-61 victory to beat Guyana—who went through the tournament winless—and finished ninth overall.